An account of the battle which ended the United Irish Rebellion in Ulster, 216 years ago this week. By Marcas Mac Ruairi. 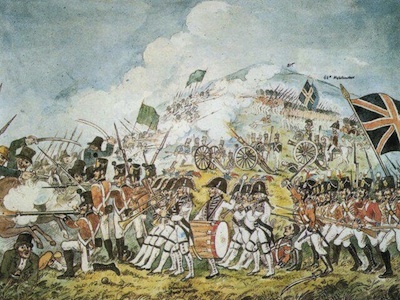 The Battle of Ballynahinch was the desicive encounter which put paid to the rebels’ plans for a successful rising in Ulster in 1798. On 12 June 12 he marched out of Belfast. When he reached Saintfield he found it abandoned, many of the residents having fled. Setting it alight he continued to Ballynahinch. To Munro’s eight small cannon, Nugent was heavily armed. An eyewitness reported on the scene as dawn broke: “A mixed and motley multitude met the eye. They wore no uniforms, yet they presented a tolerably decent appearance, being dressed no doubt in their Sunday clothes, some better and some worse. The only thing in which they all concurred was the wearing of the green, almost every individual having a knot of ribbon of that colour, sometimes intermixed with yellow in his hat. The Battle of Ballynahinch occurred on 13 June 1798, 2016 years ago this week.